How do I hook this up? That’s a simple question, in theory. Anyone who’s decided to jump head first into a home studio may actually find that a bit more complicated than initially planned. There’s a wide variety of connectors for different purposes, and staring at a wall full of cabling at your local music store can be pretty intimidating. This guide will hopefully help you get an initial grip on what you’re looking at and what you may need. These connectors are common in consumer audio and video. They provide two connections for a signal and a ground so they cannot carry balanced signals. In addition to typical stereo audio signals they are also commonly used as video and digital audio connectors due to their wide signal bandwidth. These you may recognize immediately from a guitar cable. 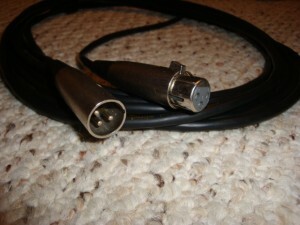 This type pictured on the left is a TS or Tip Sleeve type and like RCA has only two connections for signal and ground. Though common for instruments and patch bays etc, they are not the best of connections and will not be found beyond the bandwidth of a simple audio signal. On the right in the image we have a TRS version of the connector. The R in the middle stands for Ring. That’s the third connection on the plug which allows it to serve several additional purposes. It can carry a balanced audio signal with +, -, and ground. It can be used to both send and return a signal from a single jack. It can also be used to carry both left and right signals, like in most headphones. This connector is identical in all but the dimensions for the standard portable audio headphones on your MP3 player. 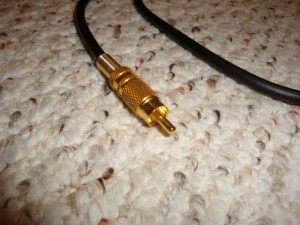 This connector type is most commonly recognizable as a standard microphone connection. These are typically used to carry a single balanced signal over long distances with minimal noise. Another thing you may notice with this type of cable is that unlike the other cables, it’s ends are not the same and are instead male and female counterparts. This is handy for stringing along a few of these in a row for extended cable runs, which is possible within reason, say under 100 feet, without a huge amount of degradation. 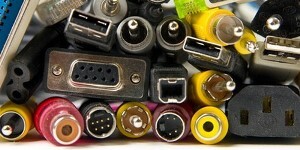 Now that you can recognize the types of connectors used, you may be confused about the handful of acronyms that accompany the connection you need to make. This will be carried over RCA connectors typically, and run at about the standard -10dBV level. That is actually a ratio of 10dB below 1 Volt RMS, or about 0.316VRMS. The inputs are in the 10k Ohm range input impedance so it’s not hard to drive a consumer line level input with just about anything. This can be carried over Phone, XLR, or even RCA cables and has a standard level of +4dBu, which is a little more confusing of a ratio as it’s relative to 1 mW of power across a 600 ohm load. Really, it comes out to about 1.2VRMS. This is carried pretty much exclusively over XLR cables, and has a very low signal level depending on the microphone type. Microphone pre-amps have a great deal of gain and a wide range of adjustment to accommodate the variety of microphones out there. There are cheapo microphones that use other cables, but if you’re trying to do anything good, you’ll want to avoid them (such as PC microphones). This is almost exclusively carried over a unbalanced TS phone cable, and varies wildly in signal strength. Passive vs. Active pickups, basses and guitars, all have different signal outputs and work best with a very high input impedance pre-amp (greater than 500k ohms). 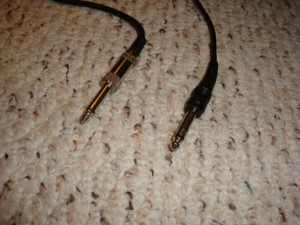 Generally it is best to hook these to a device specifically made to handle that signal in order to get the best sound. Speakers can be hooked up with bare wires, specialty connectors, and sometimes phone jacks. These have very high signal levels and can never be mixed with line level devices, unless you’re going for a large plume of smoke. This is carried over either an RCA cable, or an optical fiber cable. The RCA cables are slightly different than your generic audio cable, as the impedance is 75 ohms, the same as consumer video. This is determined by the insulation and shielding and has nothing to do with the resistance of the conductors in the cable. You local store may try to sell you some really expensive “digital” cables, but the truth is this signal is pretty robust and if you hook it up and get a lock, you’re hearing everything you need to. There is a limit however, long cable runs must be avoided over RCA cabling, and optical may need a repeater to reach a good distance. This is a similar digital audio stream, but typically uses a balanced XLR cable for transmission, giving it better length of cable runs. This also isn’t so common in anything but your higher end studio equipment. There’s no shortage of people who decide to use a standard connector for there non-standard signal, so while these few standards can get you started, be sure to check your equipment manual before assuming what you’re hooking up will work. In the analog audio signal world, you can get away with hooking nearly anything together with the proper cabling and adapters. There’s a few steps to take before you try this though. If there’s signal coming through with these settings, you’ve got some incompatible levels and you should look into some other solution. If everything is silent, continue. Adjust the input level to a normal level for the inputs you may typically use. For example, if you’re plugging into a consumer stereo, turn up the volume to a normal listening level. Turn up the output level until you start getting some signal through. If you’re lucky, you’ll have a working connection.. done! If it’s not working or you hear distortion, quit before you damage something and get yourself the proper pre-amps etc.